Fun This Week - Bubbles Bubbles, so many of them! 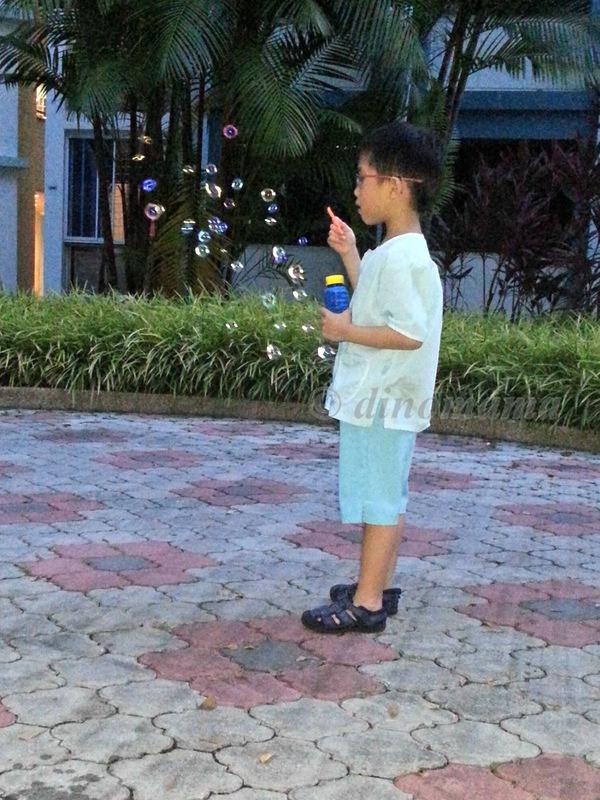 I've always like bubbles, love the way they float up into the sky, love the way the kids chase madly at them trying to hold them in their palms or some want to have a taste of them. DinoEgg love bubbles too but he seldom gets the chance to play with it because to do so that means we have to be outdoor. I wasn't really game for it, plus where's the fun when you only play with it ALONE? Anyway I was in Toyrus and without thinking I grabbed a small bottle of bubbles while checking out, thinking that we should have some bubble fun that evening after school. DinoEgg was thrilled! 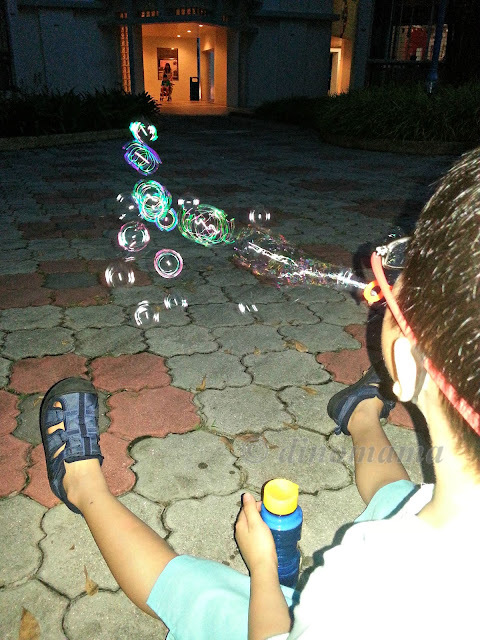 Since we were having bubbling fun at the common walkway downstairs, we attracted a few attentions, mainly from the kids who joined in for a few seconds to catch the bubbles. It was kinda lonely... 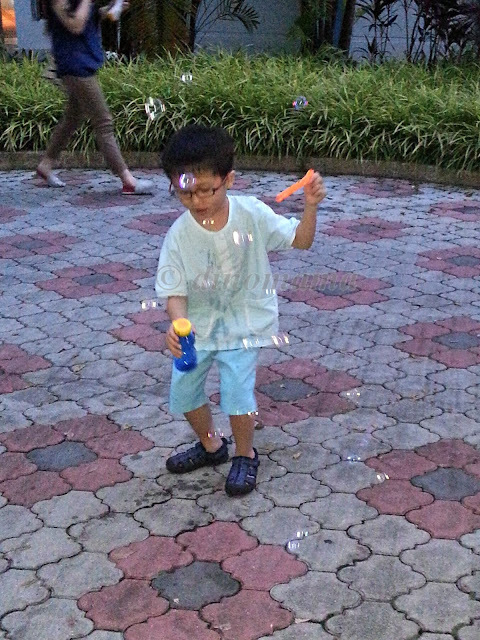 I tried to cheer him on to get more bubbles out flying. 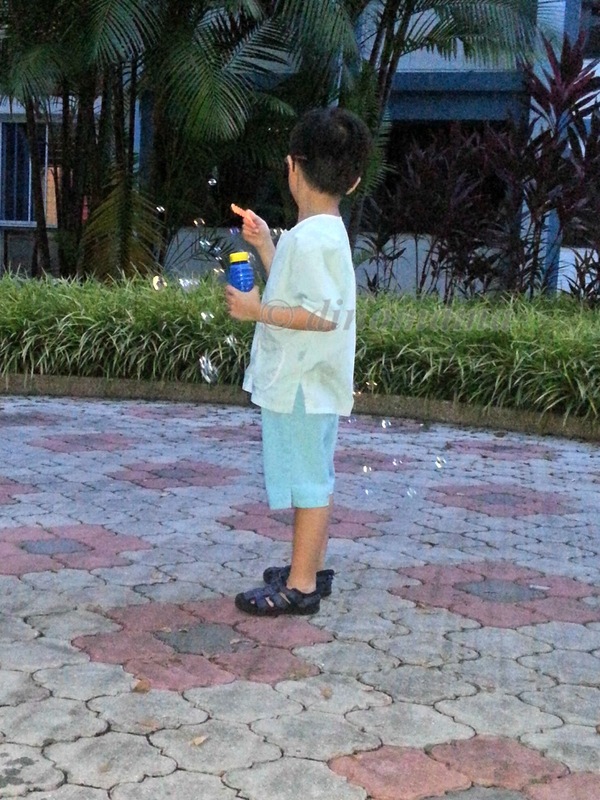 He was doing all the hard work; blowing the bubbles and chasing after them (spilling some of the soapy solution at one point) trying to kick, burst, catch them. 20mins later, he gets tired of running around and sat down to continue. Darkness fell soon too. And guess what? We had fun in another way! 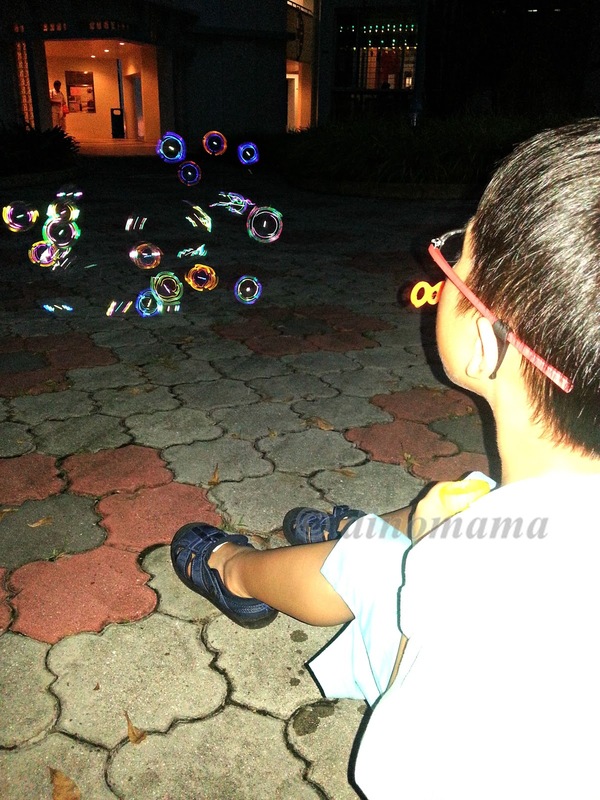 Seeing the bubbles in their rainbow colors floating up into the air. What a beautiful sight! We had fun, definitely! He also took back "souvenirs" on his legs from them merciless mozzies... Next time we shall be better armed! I shall get a bottle of bubbles and join in the fun. I shall get some bug spray n keep them mozzies away! *All photos taken by my Samsung Galaxy III. Wish I had my Canon with me to catch more photos of the rainbow bubbles. My boy also loves bubbles. He especially loves to pop the bubbles.